On 23 June 2017, a number of Norwegian environmental and rights-based organizations – including Greenpeace, Norwegian Church Aid, Norwegian Solidarity Committee for Latin America, and Rainforest Foundation Norway – protested Brazilian President Michel Temer during his meeting with Norwegian Prime Minister Erna Solberg in Oslo. Meanwhile, Norwegian government officials have stated that Brazil is risking the aid given by Norway to rein in deforestation in Amazon. Deforestation has sharply increased from 2015 to 2016, with the highest rate of loss of forest recorded since 2008. 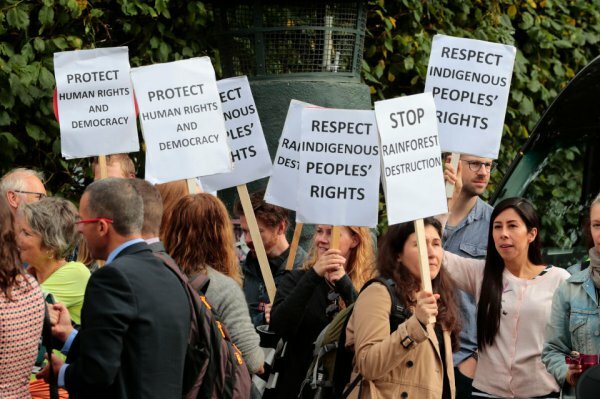 The organizations stressed that Temer’s administration is not only endangering the rain forests in Amazon but also the lives of indigenous people and human right activists in the country. According to Sônia Guajajara, an indigenous leader from Brazil, who also took part in the protest, the new measures brought by Temer’s administration earlier this year, loosening control on illegal logging, will severely harm indigenous people. Deforestation in the Brazilian Amazon from 2015 to 2016 jumped 29 percent over the previous year, the highest rate of loss recorded since 2008. Political efforts to weaken environmental regulations are largely seen as responsible for the increase, though dry conditions in the Amazon, the world's largest rainforest, and Brazil's foundering economy, which has devalued Brazil's currency and made agricultural exports more profitable, are also to blame. In a letter sent to Brazilian Minister of Environment Jose Sarney Filho, Norway's environment minister, Vidar Helgesen, noted the "worrying upward trend" in deforestation since 2015, according to reporters with Reuters who saw a copy of the letter. Data released by Brazil's National Space Research Institute last November showed that 7,989 square kilometers of Brazilian Amazon rainforest were destroyed between August of 2015 and July of 2016. According to Reuters, "under current benchmarks, a rise in annual Amazon deforestation rates to 8,500 square km or above will mean no annual payments from Norway, Norwegian officials say." A number of Norwegian environmental and rights-based organizations, including Greenpeace, Norwegian Church Aid, Norwegian Solidarity Committee for Latin America, and Rainforest Foundation Norway, say they are planning a protest in front of the prime minister's residence in Oslo on Friday to make it clear to Temer that they view his administration's policies as not only putting forests at risk, but also the very lives of indigenous peoples and human rights protectors in the country. Sônia Guajajara, an indigenous leader from Brazil with a group called the Articulation of the Indigenous People of Brazil, will be in Oslo to take part in the protest. She says that an ordinance passed by the Temer administration earlier this year that removed the power to demarcate indigenous lands from FUNAI, Brazil's National Indian Foundation, will harm indigenous communities. The bancada ruralista and large-scale landowners applauded the measure, while indigenous land rights activists said it would lead to more violence and decried the ordinance as unconstitutional. "Temer violates his obligations and undermines people's constitutional rights," Guajajara said in a statement. "His attacks on indigenous peoples and the environment are of a magnitude we have not seen before."